A flower show on the Lancashire coast: sea breezes and beautiful flowers, all in one of England's pleasantest towns.For four days in August flower enthusiasts come for their fix of floral beauty and go away well-sated. My role? I entered by the exhibitors' gate, but I had no flowers to show, for I was present as an adviser, working with the Chartered Institute of Horticulture, one of the staff sent to give advice on flowers and growing to the visiting public. It was a rewarding experience. I have done flower shows before, but this was a show new to me and I was doing it with an organisation for which I had not previously worked, the prestigious Chartered institute of Horticulture, of which I was elected a member last year. The Institute had asked for members from North West England and North Wales branch to staff the advice stall, which is located in the plant societies and amateur growers marquee.I was allocated a slot on the Friday, the second day of the show. Getting there for 9:45 entailed an unusually early rise at 5:45 to catch the 7:47 from Manchester, but Maureen was kind enough to give me a lift to the station. The show was held in Victoria Park, Southport, overlooking the Irish Sea across the town's huge beach. Southport is a refined town with a genteel atmosphere, and so a flower show well suits its ambience. It has been holding its own flower show for 89 years, starting in 1924 [with a cessation in war time.] The event became independent of the local council in the mid 1980's. The park is quite small, so perforce the show is limited in size, but what it loses in size it gains in other ways. At no previous flower show have I met the chairman of trustees, a pleasant gentleman who came round to visit the exhibitors, and was warm and friendly. The arrangements for exhibitor entry were that I walk round to the seaward side of the park and collect my badge from the show office.There was an easy going atmosphere compared to the RHS show in Tatton Park, where the police insist that all exhibitors have a personal pass with a photograph, security in these terrorist beset days. There was a simple pass which is handed in again at the day's end.It reminded me of the earlier, safer England of my youth. It was also generous, as I discovered when I went to buy a pork and black pudding pie for my lunch. When the woman pie seller only charged me two pounds for the pie instead of the full price, being honest I queried her, only to be told "You have an exhibitor's badge." That entitled me to discount food and drink, and I got tea for half price. A really nice little show. I shared a stall with two men, Vic and Bernard, and at sixty eight I was the baby of the trio, for they were seventy and seventy six respectively, but very fit and healthy men, as gardeners are. A woman was appointed to the stall, but she had chosen weekend and so I did not meet her.She is quite senior in the branch, and so does some of the administration. I am only at the rank of member of the institute,but Bernard holds the rank of fellow, along with a special medal of honour from the Royal Horticultural Society that can only be held by 100 people at a time. This guy had managed a fifty acre nursery and orchard, and he really was an expert. He was with us half the day, as he was also on a stall showing tomatoes and was staying all four days. But when you reach his rank people want you there all the time. "The start will be slow "said Vic, who has done this show before, "but then they will come quickly. " And so it was.It was a challenging, though fulfilling experience, and I was glad to have my two friends with me. Most visitors were local and so the problems were those of growers on the North West English coast.One woman told me that her Italian Cypress trees were not growing well, but I had to tell that as she lived a hundred yards from the sea the cold, salty winds were killing them, for they like the warm climate of Italy. Another informed me that her honeysuckle was not thriving, no matter what she did.On investigating I found that it was in a dank, not well lit spot and was therefore attracting powdery mildew spores. Solution: replant a honeysuckle somewhere else in the garden Others had fungal problems, for example on Victoria plums, and so I told them that on mine I use sulphur dust, which the fungus does not like. One old man saddened me a bit. He told me that beneath his garden there was a hard layer of clay that he could not handle. I told him that he needed a mattock,a kind of horticultural pick-axe, but he said that at eighty he could not handle one. Solution:use the no dig method, in which you build up the soil above ground. He left satisfied. There were times when I was glad of Bernard's expertise, as he knows such a vast amount, and I began to see the importance of having several people on a stall. We pool our knowledge, for horticulture is such a large subject that we all have gaps in our knowledge. Fortunately no one asked me about garden design. One woman asked me about growing cottage garden style with wild flowers, but I pointed out that she was trying to mix two incompatible styles, for wildflowers require low nutrient soil, whereas cottage gardens use garden plants, which use a well-nourished soil. Fortunately I was able to direct her to the other side of the marquee, where the cottage garden society had a stall. In fact, we sometimes directed questioners to the stall right for them.One man asked about taking begonia cuttings, and I just said, "Look behind you. " 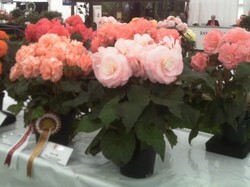 He did and saw the Begonia Society display. "You''ll get expert advice from them." I told him. Some questions required referral to the appropriate professional. An old lady in an invalid chair had a lovely, productive lemon in her conservatory and wanted to re-pot it. What compost would she use, she inquired. I recommended that she went back to the grower and got a mix suitable for the tree. I have never grown citrus and could not advise. Two questioners arrived with the same problem, geranium leaves being eaten. I suggested that it was consistent with a moth caterpillar and got them to share their experiences. It turns out that one of them lives next door to a man who collects moths to study and then releases them. The problem is not solved, but at least they now know what it is that is causing it. "I wish that Dustytoes could see this." I said to myself as I wandered the rare breeds tent erected by the Rare Breeds Survival Trust. She has given us on Wizzley some interesting articles on knitting, and in the tent there were two women, one was spinning rare breed wool on a portable spinning wheel powered by a treadle. [see the picture] while the other sat and knitted it into garments. This was part of the trust's ambition to promote British wool,a necessary one in age when artificial fibres are running out. I was fascinated because I love knitted goods and think that knitting is part of an ecological harmonious future. Older forms of transport were on display. The tent was not large enough for the traditional British cart horse, which was kept in a paddock next to it. These horses were Clydesdales, which descend from the war horses of the mediaeval knights and were later used as cart horses. They are a breed with a great temperament and are justly popular. They were still pulling carts in my younger days of the 1950s. The experience took me back to my childhood in inner Manchester. But talk of nostalgia. I could not resist the display of Bedford trucks. Not that I am a great motor vehicle fan, but as a boy I had a large collection of Dinky toys, toy cars, and the Bedford truck was one of them. In 1954, when the truck on display was the latest model it was a treasured part of my dinky collection. Vintage now, and it is younger than I am! Ah, the advance of the years. This one on display still had its original tyres. Not bad for a vehicle sixty four years old! There were also a small number of show gardens produced by local garden designers, all of them hoping to add to their portfolios so that they can build up towards an appearance at Tatton, Hampton Court or Chelsea. For these designers small shows are a stage on the way, but some local institutions that sponsor show gardens, for example schools and hospitals, may be content with an appearance at the local show. By five o'clock pm. I was feeling the strain. I had walked from the railway station and had spent most of the time from 09:15 to 17:00 on my feet, without a great deal to eat. Vic said that the show was winding down for the day, and he spoke from experience. We shut the stall and I walked back to the railway station. The train journey was over an hour long, but I dozed for most of it. I loved doing the show, and next year I will have more ideas about what questions are coming. I can then do better research ahead of the event. Haha... I always used a camera too until a couple years ago. The iPhone makes it so much easier. Thanks for the advice.You are right about becoming good with practice. However, I do not have a smart phone. As for my "new" Nokia,my daughter said in a kindly way that it was what was the height of fashion when she was seventeen. She is now thirty three! I use a small camera. It is my own humble opinion only. The more you begin to add photos, the better you will be at taking good ones to share. And if you use a smart phone to take your photos, be sure to take lots of the same thing so you can choose the best one from many, and delete the bad ones. That is the nice thing about using a phone. Thank you. I had not realized this. Personal photos lend a great deal to a story and they certainly don't have to be perfect to be appreciated by the reader, IMO. Did the day pass quickly? Not really, but although my legs were tired the day did not drag. I really enjoyed myself doing what I love. At shows the societies use me to talk to the public. My friends attitude is "Leave building the stall to us, you just do the talking!" Thanks for the praise for the photos. I have had such little praise for my visual work that it comes as a welcome surprise. But the experience also caused me to learn more, especially about flowers, and it has led me to research some of my weaker areas. I am researching basic information about a different plant genus every day now. Frank this sounds like such fun. The idea of putting 3 knowledgable people in a stall to answer questions does allow for all of you to learn from each other and compare info. You thought of me!!! What a fun surprise to hear that. I certainly would have loved to see the spinning and knitting. This is exactly the type of fair I love to visit, and did so when I lived in NH. I imagine your day passed quickly with so much to do and enjoy. AND... great photos !!! The roots on those vegetables are incredible! Yes, I am glad that I conveyed my joy in the experience. As for the setting: many older people like to visit the town on holiday because it is quiet and refined.